School’s out, Holy Week is over and done, and temperatures in Manila continues to climb. Summer is definitely here. Anticipating family outings throughout the school holidays, Enchanted Kingdom has new attractions that both parents and children can enjoy. Last Easter Sunday, Enchanted Kingdom formally launched Zoori’s Adventure, an interactive museum where kids can learn more about lions, their habitat and survival skills. 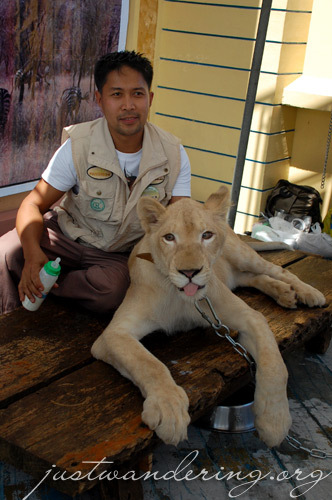 Guests can also have their picture taken with Zoori, a white lion. Another new feature that kids and adults (well, those weighing 130lbs or less anyway) can try is the Bungee Fun. It’s basically jumping on a trampoline while harnessed to bungee cords. The thing allows you to jump and roll as much as you want without the fear of missing the trampoline on the way down. Also coming this summer is Dora and Diego at the 4D theater, and the EK Biki Waterworld. The latter is a new installation just outside the park of six giant inflatable pools with water slides, games and rides. The waterworld will be formally launched on April 18, 2010, and will have a separate admission ticket. In between rides, you can listen to stories narrated by celebrity storytellers at the bandstand. Story tellers include Winnie Cordero (April 10), Bearwin Meily (April 11), Jose Manalo (April 17), Candy Pangilinan (April 18) and Eugene Domingo (April 25). 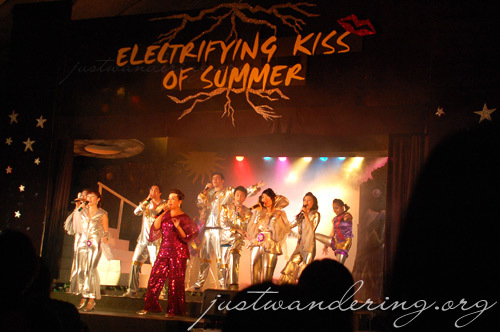 As you wind down the day in the park, take a rest in the airconditioned comfort of Eldar’s tent as you watch the “Electrifying Kiss of Summer,” a musical extravaganza that features EK’s very own VP for sales, Ms. Cynthia Mamon. Enchanted Kingdom have a couple of treats for students and Mercury Drug Suki Cardholders. Students with valid school IDs can get a Regular Day Pass (ride all you can) for only Php 335 (regular price is Php 500). This already includes admission to Zoori’s Adventure (admission ticket is Php 60 on top of the day pass), and is only valid until June 6, 2010. Suki Cardholders can avail of Enchanted Kingdom’s 3+1 package, wherein they can buy 4 Day Passes for only Php 1,500 on weekends and Php 1,200 on weekdays. This promo is only valid until April 30, 2010. RELATED: How does a Cebu guitar sound like? Once again, huge thanks go out to Enchanted Kingdom for having us over last April 4. 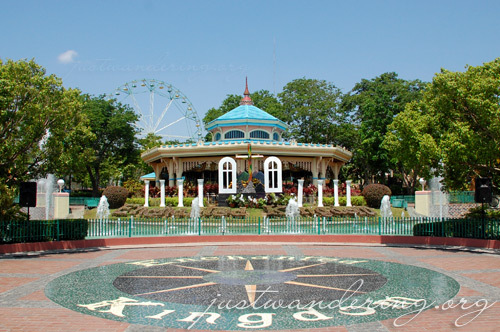 Enchanted Kingdom is open daily this summer until June 6, 2010. The park opens at 11am on Saturdays and Sundays, 2pm from Monday to Friday. If weekend’s the only time you can visit the park, it’s best to go on a Sunday, as the park is usually packed every Saturday. For more information, visit www.enchantedkingdom.com.ph. something new at EK ah, thanks for letting us know ;-) i wanna meet zoori soon. wow, zoori looks really inviting! makes me want to bring my family again to EK soon. thanks for sharing. This is pretty interesting. Its been a while since I last set foot in enchanted kingdom, and zoori is so cute, something to look forward to on our next visit. Sign me up. I want my picture taken with the lion…provided that it stays far away. Are you heading to their Waterworld when it opens? It’ll probably be packed though, so maybe the grand opening wouldn’t be the best time to go. I can’t wait to see what reviews you have of their water park when you do get a chance to check it out.